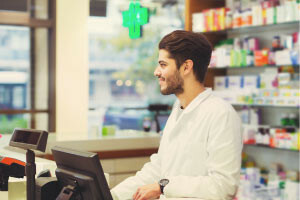 There are many different types of pharmacies with different roles and responsibilities. In this course, you will learn the difference between a community pharmacy and institutional pharmacy. You will gain an insight into the workings of each pharmacy such as the types of prescription drugs, filling and dispensing of medications including proper procedures for preparing, labeling, and repackaging, the forms of sterilization, and infection control. This course will first introduce you to the role of the pharmacy technician in a community pharmacy. The course will cover prescriptions, e-Prescriptions, patient profile, over-the-counter (OTC) drugs, the two types of prescription compounding, and Drug Utilization Review (DUR). You will learn the business functions in the pharmacy as well as the importance of knowledge in math principles including business math. You will also learn the importance of being familiar with drug inventories. Next, you will look into the role and responsibilities of the director of an institutional pharmacy. You will learn about medication order procedures and look into microbiology. You will study Total Parenteral Nutrition (TPN), Infection Control Committee (ICC), the sources of contamination, the different methods of sterilization, and hazardous agents. You will also learn the most important practices for minimizing touch contamination and reducing the transmission of infectious agents. This Community and Institutional Pharmacy online course contains information that will be most valuable to pharmacists, pharmacy technicians, or directors of a pharmacy. It clearly explains the role of each professional and teaches important terms related to the pharmaceutical industry. Every pharmacist and related professional is responsible for delivering safe and effective medication for all patients, so take this course now and ensure your knowledge is securely refreshed and restocked. Describe the role of the Institutional Review Board in approving investigational drug studies. Explain the functions of a hospital pharmacy department. Describe the roles and responsibilities of the director of pharmacy, pharmacist, and pharmacy technician in a hospital pharmacy. Explain the role of pathogenic organisms in causing disease. Distinguish among bacteria, viruses, fungi, and protozoa. Identify procedures to minimize airborne contamination during the compounding of sterile preparations. Identify the role of the Infection Control Committee within a hospital. Discuss the importance of and techniques for preparing, handling, and disposing of hazardous agents.